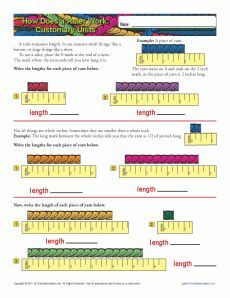 This worksheet demystifies the use of a ruler with customary marks. With colorful yarn, it explains what the lines mean. It's perfect for a student just learning to work with a ruler. Use it in conjunction with Common Core Standards for 2nd grade Measurement and Data or for any student who needs the practice.